The BBC has reported on the involvement of MIRA in the UK within the European Saferider Project, who purport to be a leading independent provider of product engineering, testing, consultancy, certification, research and information. We have reproduced the article below and leave it up to you to take it as read as a motorcyclist, whether time and money have been wasted and whether there really is any knowledge at MIRA, that pertains from the portion of your body that you sit upon and the portion of your arm that you rest on at a table! However one comment, we can’t help ourselves, Jonathan Moore, an ITS consultant at Mira said, “making safety systems on motorbikes useful was “challenging” because of all the distractions to which riders were subjected. Well Jonathon, perhaps that because the rider is concentrating on riding the motorcycle, the job at hand. So you recognise that distraction is a bad thing but then fit scanners, haptic handles and gloves (vibrabrating) , a vibrating seat, lights, smart helmet-cameras and radar, a motor in the cheek pad of the helmet so if you do not notice the object it will vibrate and give you a tactile warning. 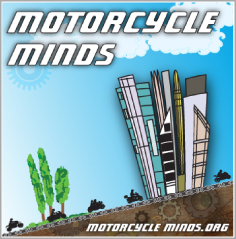 At Right to Ride we are absolutely flabbergasted at this report, Saferider and all its partners continue to show no understanding of motorcycling and more importantly us the motorcyclist. 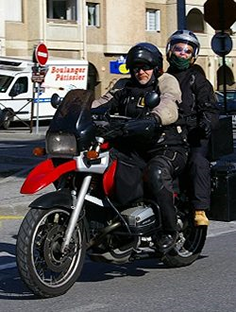 “Saferider takes the driver safety systems that are becoming standard on cars and tries to adapt them to the unique needs of motorcyclists,” said Jonathan Moore, an ITS consultant at Mira, involved in the Saferider project. Mr Moore said making safety systems on motorbikes useful was “challenging” because of all the distractions to which riders were subjected. One system tested works out if riders are travelling too fast to negotiate upcoming bends. Mira has developed software that acts as a “co-pilot” which, with the help of a digital map, knows what speed they should be travelling to make it round a bend. “We put a motor in the cheek pad of the helmet so if you do not notice the object it will vibrate and give you a tactile warning that there’s something to the right or left,” said Mr Moore. “They do not give the attention to the road they should or have the experience to deal with problems,” said Mr Moore. Saferider is a collaborative R&D effort that is part of the European Commission’s Seventh Framework Programme. Participants include Mira, Yamaha, Porsche Engineering and Fema, among others. I have been riding for 30+ years and I came in this world with safety features built in from birth. Eyes to see with, touch to feel what the bike is doing on the road surface and the ability to learn from doing. In this case riding a motorcycle. Lets look at some of the systems tested: Co-pilot a software program with help of a digital map that knows what speed we should be travelling around a bend. Also what’s to stop the same software being adopted to monitor speed and location for the use of road law enforcement. Or control your speed based on speed limits. I don’t condone speeding, but I do believe in individual choice and responsibility for your own actions. “One system under test based around radar constantly monitors the blind spots around and behind riders. Mirrors and the Life Saver has been used for years to let me know what’s going on around me. Given the amount of traffic on the roads you would be getting consent tactile warnings from their system. What a thought. What effect would the extra weight or the fitting of vibrating motors, cameras have in an accident? Do they come built in or a add-on? Motorbike collision detection systems developed by Mira warn a rider about an imminent impact and let them take action by slowing down sharply or, in the case of a vehicle travelling in the same direction as the bike, following it while slowing. If there was an imminent impact about to happen I would imagine you would be aware of it. and would slow down sharply or am I missing something. And then this: The safety systems could be a boon to less experienced bike riders.“They do not give the attention to the road they should or have the experience to deal with problems,” said Mr Moore. Where do they get the experience from if electronics control the bike and does this not also apply to car drivers. If they were to give people more incentive to take advanced training, car and motorcycle it would have a larger effect on the road we all share, but then its about having control more that road safety. It will soon be you will not need a test to control a vehicle on the public highway, we will have no control.